“Financial globalization appears to have produced adverse distributional impacts within countries as well, in part through its effect on incidence and severity of financial crises. In a remarkable series of papers, researchers at the IMF have documented these negative inequality impacts (Jaumotte et al. 2013; Furceri and Loungani 2015). Most noteworthy is the recent analysis by Furceri et al. (2017) that looks at 224 episodes of capital account liberalization, most of them taking place during the last couple of decades. Liberalization episodes are identified by big changes in a standard measure of financial openness (the Chinn-Ito index) and large subsequent capital flows. 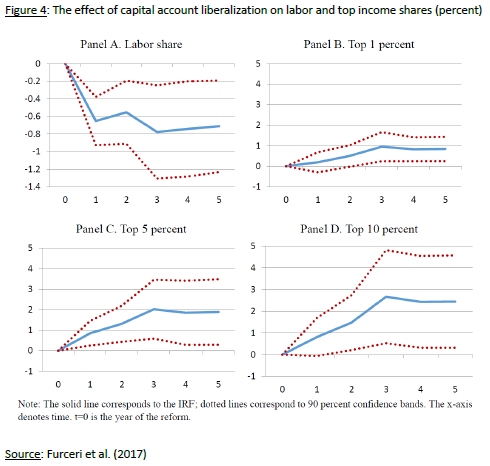 They find that capital-account liberalization leads to statistically significant and long-lasting declines in the labor share of income and corresponding increases in the Gini coefficient of income inequality and in the shares of top 1, 5, and 10 percent of income (see Figure 4 for their key results). Furthermore, these adverse effects on inequality are stronger in cases where de jure liberalization was accompanied by large increase in capital flows. Financial globalization appears to have complemented trade in exerting downwards pressure on the labor share of income.